North Island NZ by Train will feature travel by exclusively chartered railcar. Travelling throughout the North Island of New Zealand by private train and complemented with coach touring and special ferry journeys. Insights Tours has chartered Tokumaru, the railcar pictured above for an exclusive travelling experience. Furnished with 48 seats but with a maximum of 24 guests, you can be assured of a very comfortable and enjoyable experience. Our wide-ranging tour of the New Zealand’s North Island will encompass all the operational lines; many of which no longer see regular passenger trains. Even if you’ve been to NZ previously, travelling and seeing the beautiful landscapes from a chartered railcar is certain to be a truly memorable experience. 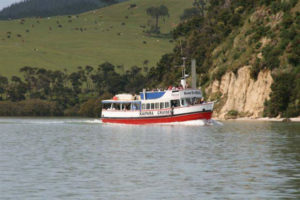 This 12 day tour includes a very special cruise by chartered vessel on Kaipara Harbour from Port Albert to Pahi; – a rarely-seen region with a long and interesting history which will be revealed during our cruise. The full, detailed itinerary is available below.